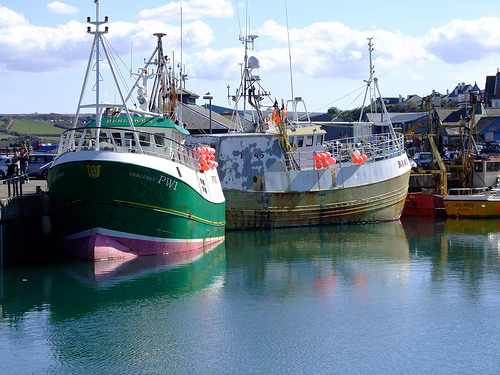 Although the fishing fleet in Padstow has decreased dramatically over the last twenty years, various types of fishing vessel still operate from or call into, our harbour. Padstow has no fish market, so all catches are landed on the South Jetty and then ‘overlanded’ to the fish markets in Newlyn, Plymouth or very often, on the continent. Fish is landed into refrigerated lorries and shellfish into special ‘Vivier’ trucks which have inbuilt salt water tanks to allow the shellfish to stay alive for many days. 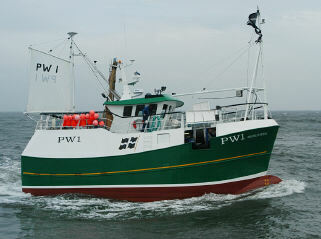 Every registered fishing vessel has “registration numbers” clearly marked on it to identify its port of registry – ‘PW’ is Padstow etc. We are often asked where particular registration numbers relate to…. please follow this link to find out! These large powerful boats tow a net along the seabed – the mouth of the net is held open by a steel beam. 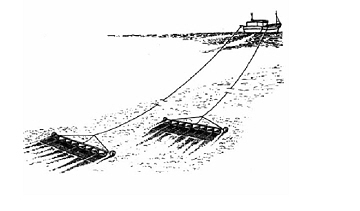 Typically, one beam and net are towed off a ‘derrick’ on each side of the vessel. The beams are attached to a powerful winch via a long wire or ‘trawl warp’ which allows the net to be hauled back to the vessel. The fish collect in the ‘cod end’ of the net which is lifted aboard the vessel before being untied to spill the fish onto a sorting / gutting table. 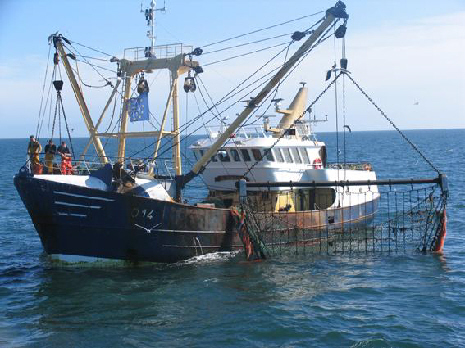 Species targeted by beam trawlers include Dover sole, Plaice, Lemon sole, Megrim Sole and Monkfish. We do not have any beam trawlers based at Padstow Harbour, but we do get a lot visiting (usually in January, February and March when the Sole fishing off the North Cornish coast is good) to land catch and replenish fuel, ice and water. Typically a beam trawler will have a crew of 4 to 5 and will stay at sea for 10 days with a short break of perhaps 48 hours between trips. Gill Netters such as Padstow’s two local boats ‘Berlewen’ and ‘Charisma’ shoot sheets of thin netting which is anchored in the water to catch fish by enmeshing or entangling them. 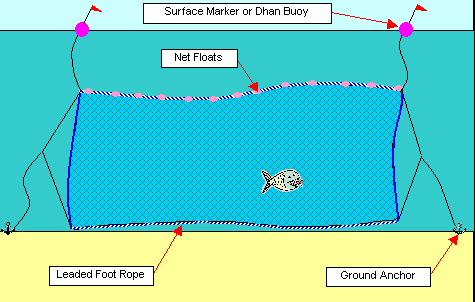 The bottom of the gill net (foot rope) is weighted and the top (head rope) has floats threaded onto it – this causes the sheet of net to stand up in the water column creating an invisible wall. The vessels do not normally fish during spring tides - the tidal currents are too strong for the anchored nets to stand upright and they would either not fish correctly or get tangled up and damaged. Hauling and sorting the nets by hand would be virtually impossible and very time consuming. 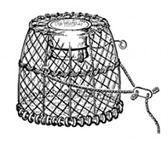 Nowadays, many modern mechanical aids are used to haul the net inboard and then to ‘overend’ it to prepare if for ‘shooting away’ the next time. “Berlewen is a family owned purpose built gill netter, employing three generations of the Chapman family. Built in 2003, she has greatly improved crew comfort, efficiency and safety and the crew are now in a completely covered working area. Fishing with either gill nets or tangle nets, she catches Monk, Turbot, Brill, Pollock, Ling and Cod (as much as allowed). We use anything between about 5 and 25 miles of net at any one time, depending on which type of fishing we are doing. Fishing over a wreck uses only a small amount of net whereas when we are fishing for turbot it can stretch up to about 25 miles. Gill netting is very environmentally friendly with little or no impact on the seabed eco system, also only mature fish are caught. Mesh size varies from 5.5” to 10.5” depending on the fish being targeted. Also, fuel consumption is low compared to trawling. Berlewen is the only 14m plus purpose built netter in the South West. Her dimensions are 15m overall length, 5.9m beam and 3.4m draft. If you have any questions please feel free to come and ask us if you see us working onboard the boat in Padstow, we are always pleased when people take an interest. If you want to watch our progress at sea you can simply google ‘AIS Lands End’ where you can see where we are fishing and track our passage”. There is a thriving fleet of inshore potting boats which work out of Padstow – the majority leave early in the morning and come back in again on the afternoon / evening high tide. 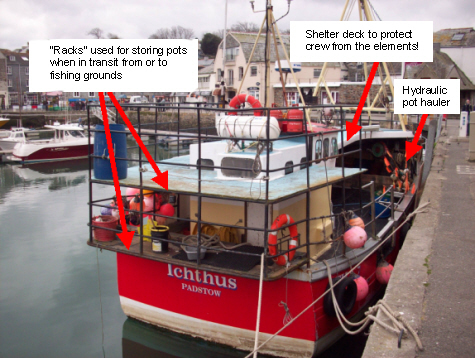 Larger “Crabbers” such as the “Icthus” or “Trevose” have accommodation which allows the crew to live aboard overnight – these vessels usually leave the harbour for a trip of three to four days in duration. Most of the crab landed in Padstow goes overland (in ‘Vivier’ trucks) to the Spanish or French markets. These lorries may only visit once or twice a week, so many of the local ‘day’ boats have ‘Stow’ or ‘Keep’ pots located at the entrance to the estuary, which they use to store their catch in. This is why many visitors are surprised to see fishermen coming into the harbour after a hard days work with no fish to show for it! 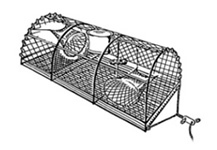 Traps in various forms of cages or baskets are used widely throughout the UK, a ‘Parlour ’ and an ‘Inkwell’ Pot are shown below. These vessels and their rigging are very similar to a beam trawler - the beams being replaced by multiple ‘dredges’. The dredge consists of a frame / toothed bar at the front to dig the scallops out of the sand and a collecting bag behind it. This bag is usually made of chain mesh on the bottom and netting on the top. Several of these dredges are towed behind a heavy spreading bar, usually one from each side of the vessel. The length of bar and number of dredges is dictated by the power of the vessel and its length of side deck to work the dredges over. 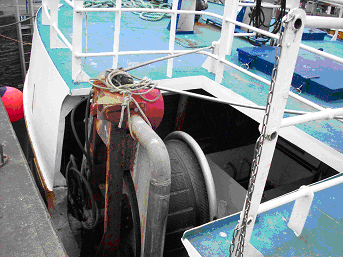 The number of dredges can vary from 3 to 4 on a small 10m boat up to 18-20 on a 30m vessel with a 1500hp engine. See which boats are where - in the sea around Cornwall. We are currently working an information sheet which will give details of the extraction of sand from the Camel estuary. Please contact the Harbour Office for details of repair facilities in Padstow. One hour cruises running daily from Padstow Summer months. Please refer to sign board on quay railings for times etc. There are many things to do for everybody in the Padstow area. Please contact the Padstow Tourist Information Centre for details of this to do and accommodation in the area.